This is a very nice milk frother available on Amazon that is in the slightly upper end of the pricing spectrum, but is great at making the creamy milk you love for your drink’s top additive. You don’t want a result that seems like a bubble bath, rather a cream with a nice consistency that is the perfect type to add to your steamy drink. This unit has a frothing disk that makes for very smooth and silky milk. Top-notch baristas love that as soon as this machine is done making your drink, it seeks out what more can be done right away. The smaller-size bubbles that are a result of the induction heating are very favorable for delicious drink mixes, and you can fill this with enough milk for one or up to three cups. A very capable drink mixer said that this also works great with tea leaves, and the two-disk setup takes turns with each other at creating the froth and actually heating the milk. Users are giving it about a 76% favorable rating on Amazon, and this is a great additive to your caffeine den after you get used to just a few little oddities. If you are working with colder milk, there may be some condensation on the bottom, and so if you start the machine as soon as you pour it in, it will work much better. 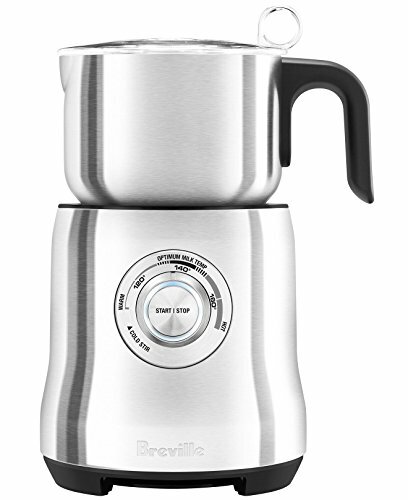 Almost any kind of moisture on the outside of the milk container can cause the Breville to shut off, but the end result is a very finite and high-quality froth mix. The adjustable temperature wins over many that are eager to get the best tasting hot beverage they can at home, and it just takes about 3 or 4 minutes for the perfect type of froth to form. Some purchasers of this product say that they had trouble getting it started and spinning up, because of the magnetic action that governs the two discs. 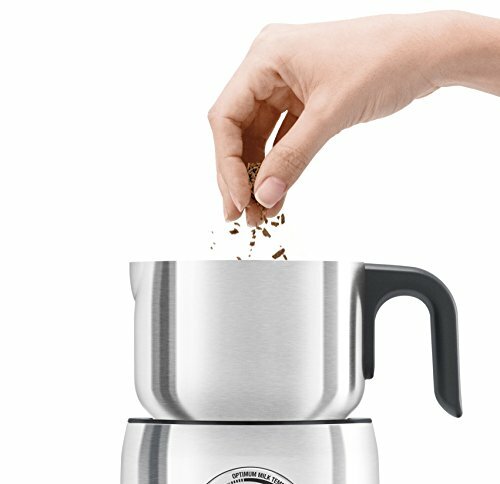 For those that are big fans of hot chocolate, this Breville milk frother really does work well for it, and is better-made than some competing products that won’t even froth milk for lattes. Using whole chocolate chips, you can simply run it with only milk until it warms up properly, then slowly add the chips to your desired flavor, which is hopefully rich! There are some bad reviews of this BMP00XL milk frother that claim that after 2-3 years of use, you try to start it up and just get a blinking light and no full juice; that disappointed user was able to send the product back and get a satisfactory replacement. For the most part, users say that this milk frother will not fully froth over unless you use too much milk to begin with, and that the end result is a perfect addition to any Americano pour as well. If you want to see more milk frother options click here. Otherwise check out our Jura Milk Frother Review.